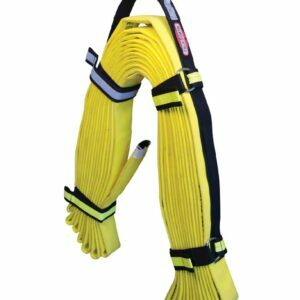 Supplyline™ Large Diameter Hose - SOS Safety International Inc. The large diameter hose (LDH) fire departments wish they always had. SUPPLYLINE™ is 100% polyester, double jacket. 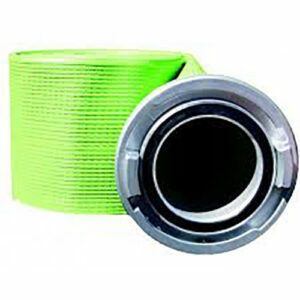 TPU elastomer lined hose with a service test pressure rating of 300 PSI (20.7 bars). Compared to traditional rubber LDH; SUPPLYLINE™ is lighter in weight, more compact, flexible to -60°F (-51°C), more abrasion and puncture resistant, and can be loaded without hanging to dry. 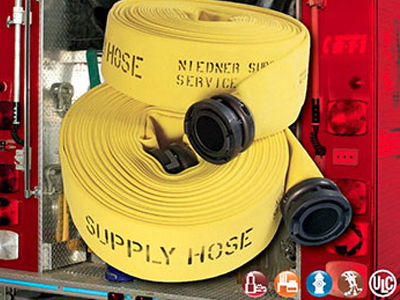 SUPPLYLINE™ is also used as a Soft Suction hose in shorter lengths. The ENCAP™ treated outer jacket improves durability, reduces water absorption up to 40%, enhances chemical resistance and adds color options. Construction: Circular woven, double jacket 100% virgin spun polyester. Tube: Extruded T.P.U. elastomer – Ozone and age resistant. ** Weights & Coil diameter may vary with finished product.